Our good friend, Emma Zen is trying to raise money to purchase oxygen masks for fire departments. 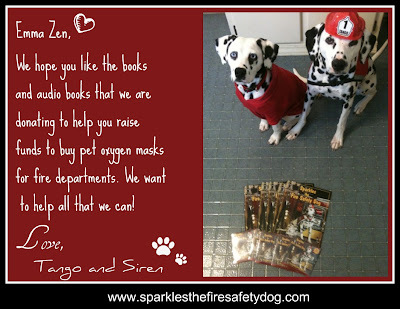 The dogs and I wanted to help out, so we are sent Emma Zen 5 copies of Sparkles the Fire Safety Dog books and 5 audio books. This book has been credited with helping save the lives of 9 people and we are so happy to help support a good cause! We help out with many causes, including helping Target's Bunker along with Surf Dog Richochet, the Keep Kids Fire Safe Foundation, and supporting the National Fallen Firefighters Foundation.